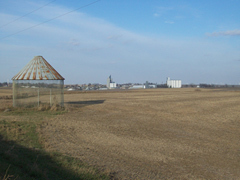 Average farmland values dropped 2.2% in the latest ISU survey. The average value of an acre of farmland in Iowa dropped by 2.2% from 2008 to 2009. The annual survey conducted by Iowa State University Extension found the statewide average on November 1st of this year was $4,371 an acre, down $97 from the 2008 figure of $4,468. Respondents to Duffy’s survey indicated that grain prices were both a positive and negative factor on farmland values. Duffy says that’s a reflection of what grain prices have been doing over the last few years. “The ethanol boom that we experienced, that started basically in September of 2006 and went pretty strong until June or July of this past year…we’re seeing it kind of leveling out. I think that’s the reason,” Duffy said. Other factors over the past year had a big impact on grain prices and, in turn, on land values. The slight decrease in the I.S.U. survey may hold some good news in relation to other recent surveys. Duffy notes the 2.2% decline compares with a 7.6% drop reported earlier this year in a Realtors Land Institute survey. Duffy says there are signs the dip in farmland values has stabilized. “It’s been kind of a mixed survey result. We did have 14 counties that were either up (in value) or showed no change,” Duffy said. Nine of the 14 counties with increases are located in eastern Iowa. Duffy believes prices in that area of the state are beginning to rebound from big drops after the flooding in 2008. Of the nine crop reporting districts in the state, northwest Iowa reported the highest average value at $5,364 per acre. The lowest average in the state was in south-central Iowa at $2,537 per acre. The highest county average in the state was Scott County at $6,361 per acre. Decatur County was lowest at $1,957 per acre. Duffy says realtors reported fewer land sales last year and the majority of Iowa farmland continues to be bought by neighboring farmers, rather than nonfarm investors.